Exmark won an 2014 AE50 award from the ASABE for its Lazer Z X-series mower. Photo: Exmark. The American Society of Agricultural and Biological Engineers (ASABE) tagged Exmark Manufacturing as the winner of a 2014 AE50 award for its Lazer Z X-series zero-turn riding mower with electronic fuel injection (EFI) and RED technology. In recognition of this achievement, the mower will be featured in the January/February 2014 AE50 issue of ASABE’s magazine Resource: Engineering & Technology for a Sustainable World, which sponsors the awards program. Worldwide, companies submit entries to the annual AE50 competition. Up to 50 of the best products were chosen by a panel of international engineering experts, who judged on the grounds of which products best advance engineering for the food and agriculture industries. 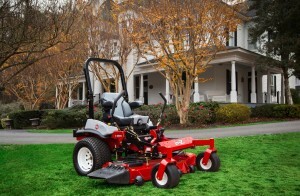 The Lazer Z X-Series mower was recognized as a complete product for including a number of engineering innovations that increase efficiency and productivity—Exmark’s exclusive RED technology combined with EFI, and an industry-first electronic governor system, delivers an up to 41-percent reduction in fuel consumption, with increased responsiveness and performance.